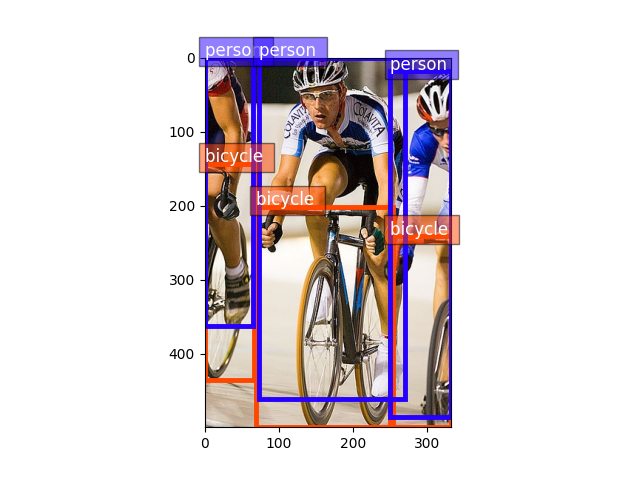 This tutorial goes through the basic steps of training a YOLOv3 object detection model provided by GluonCV. Specifically, we show how to build a state-of-the-art YOLOv3 model by stacking GluonCV components. Download train_yolo3.py Random shape training requires more GPU memory but generates better results. You can turn it off by setting –no-random-shape . Since lots of contents in this tutorial is very similar to 04. Train SSD on Pascal VOC dataset, you can skip any part if you feel comfortable. Please first go through this Prepare PASCAL VOC datasets tutorial to setup Pascal VOC dataset on your disk. Then, we are ready to load training and validation images. For YOLOv3 networks, we apply similar transforms to SSD example. 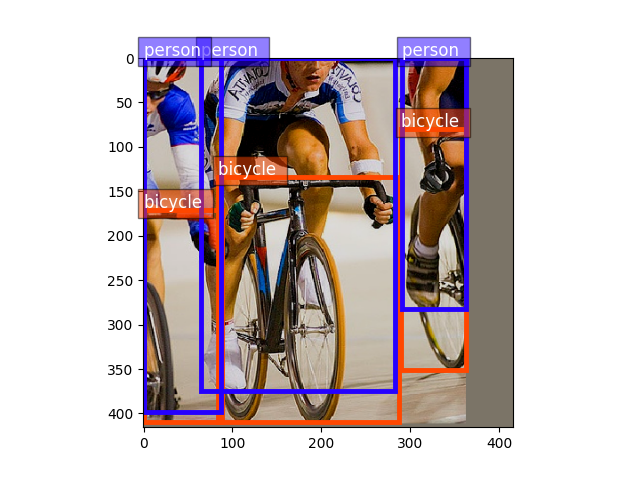 Images in tensor are distorted because they no longer sit in (0, 255) range. Let’s convert them back so we can see them clearly. Transforms used in training include random color distortion, random expand/crop, random flipping, resizing and fixed color normalization. In comparison, validation only involves resizing and color normalization. We will iterate through the entire dataset many times during training. Keep in mind that raw images have to be transformed to tensors (mxnet uses BCHW format) before they are fed into neural networks. A handy DataLoader would be very convenient for us to apply different transforms and aggregate data into mini-batches. Because the number of objects varys a lot across images, we also have varying label sizes. As a result, we need to pad those labels to the same size. To deal with this problem, GluonCV provides gluoncv.data.batchify.Pad, which handles padding automatically. gluoncv.data.batchify.Stack in addition, is used to stack NDArrays with consistent shapes. gluoncv.data.batchify.Tuple is used to handle different behaviors across multiple outputs from transform functions. GluonCV’s YOLOv3 implementation is a composite Gluon HybridBlock. In terms of structure, YOLOv3 networks are composed of base feature extraction network, convolutional transition layers, upsampling layers, and specially designed YOLOv3 output layers. We highly recommend you to read the original paper to learn more about the ideas behind YOLO [YOLOv3]. 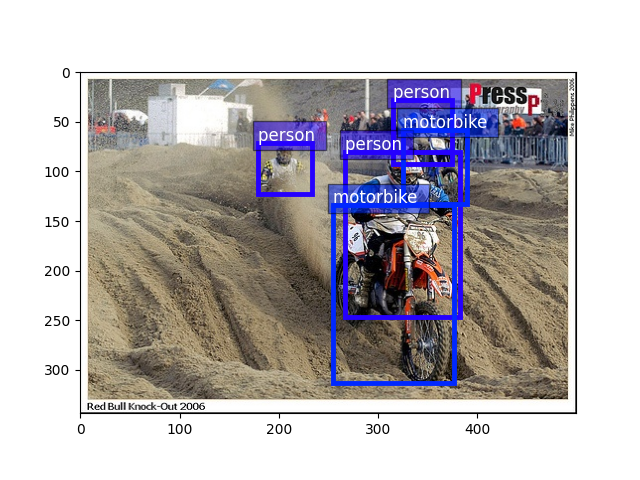 To avoid downloading models in this tutorial, we set pretrained_base=False , in practice we usually want to load pre-trained imagenet models by setting pretrained_base=True . YOLOv3 returns three values, where cids are the class labels, scores are confidence scores of each prediction, and bboxes are absolute coordinates of corresponding bounding boxes. To speed up training, we let CPU to pre-compute some training targets (similar to SSD example). This is especially nice when your CPU is powerful and you can use -j num_workers to utilize multi-core CPU. This time we can see the data loader is actually returning the training targets for us. Then it is very naturally a gluon training loop with Trainer and let it update the weights. Please checkout the full training script for complete implementation. Redmon, Joseph, and Ali Farhadi. “Yolov3: An incremental improvement.” arXiv preprint arXiv:1804.02767 (2018).